The adhesives used on bags vary widely and are constantly evolving to meet the demands of new substrates and manufacturing process requirements. There have been some recent innovations using new types of poly woven bags and plastics. 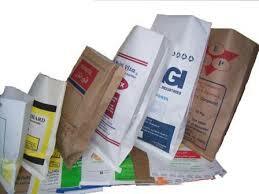 The market for paper bags is still very large; but Eco-friendly – poly woven bags and plastic films are becoming a much larger part of the bag and sack adhesive market. Seam, bottom pastes, spot pastes. Cold-water-soluble, 1 bag starch, when no high shear or heat is required. Film lamination, poly to kraft. PVOH / Clay one-bag products. VAE replacement for acrylic products. For over 40 years, Cattie Adhesives has met the ever-changing demands of the Bag and Sack manufacturing industry. Contact us for more information. Cattie Adhesives manufactures a full line of Pressure Sensitive Hot melts, PUR hot melts, Heat Seals, water-based and Dry blend adhesives for manufacturing of Bags, Pouches & Sacks with a variety of paper and plastic materials. Our Bag & Sack Adhesives are designed to bond many substrates and provide excellent adhesion to a wide range of common paper and plastic materials. Our Bag & Sack Adhesives can be Custom Formulated for Strong, Fast setting, High Shear bonds and High Heat resistance. Our adhesives are designed for use on most Bag & Sack manufacturing equipment and are made to bond well to most substrates including – Non- Wovens – Loop fabrics and Papers. The end customer demands a perfect Bag or Sack product. Cattie Adhesives offers high quality Bag & Sack adhesives that give you the results your customers demand. We supply several grades of hot melt, water based and dry blend adhesives for this market, our products provide high heat resistance, excellent adhesion properties and a very wide processing window. 8303 is a premium grade, high performance hot melt designed for use in the manufacturing of Multiwall bags and sacks. # 8303 was designed for papers, plastics, non-wovens and has very high tak, high heat resistance and high shear resistance. 8357CS is a water based laminating adhesive with high tack and bond strength used for the manufacturing of multiwall bags and sacks. 8357CS has excellent lay-flat and bonds well to many papers, plastics and films. # 8244E is a Water Based Barrier coating with great balance of water resistance and oil and grease resistance. Meets FDA regulation 21 CFR 176.170 & 176.180, good for use on direct food contact applications. Suitable for most coated & non-coated papers and boards. 8710 is a PUR Hot Melt with Very high green strength. Very good temperature, moisture and aging resistance. Low initial melt point for easy melting. Strong initial Tack. RECOMMENDED USES – Designed for the production of plastic laminations to plastics, papers, non-wovens, wood, metal. Works exceptionally well with roll-coater or extrusion system. High Green strength for immediate handling. HS410 is an EVA type heat seal film adhesive – Self-wound on a 42# silicon liner that is transferable from the silicon liner. HS410 has a wide range activation temperature with good adhesion to a variety of substrates including metals, coated films, papers and plastics. It was designed for bonding to difficult substrates. Adhesive Coat Weight lbs. : 14 ± 2. Adhesive Softening Point °F: 175 ± 5. Activation Temperature °F: 250 – 265. Application Temperature °F: 300 – 350. Dwell Time Sec: 0.2 plus (Depending on temperature and pressure). General Information – HS410 Adhesive is specifically formulated for bonding to metal, non-woven, paper and film substrates. All ingredients used in the makeup of this adhesive meet the requirements for FDA Regulation 175.105 “Adhesives”. RB91 is a rubber based pressure sensitive – Self- Wound Tape. RB91 consists of .5 mil PET carrier coated on both sides with 1.2 mils of aggressive rubber-based pressure sensitive adhesive. This tape is supplied self-wound on a C2S – 60# – White SCK liner. Adhesive: 1.2 mils aggressive rubber-based ps adhesive. Liner: 60# White SCK C2S Release Liner –Medium Release. Web Width: RB91: 54” Wide, can be slit down to any width. General Information – RB91 was designed for general-purpose bonding applications onto semi-smooth surfaces. Typically used for bonding to non-wovens, fabrics, foams, paper, metal, plastics and most low or un-plasticized substrates.